If you encounter errors when setting a route, please report them to our support staff. Get directions to a place from your My places list, including to your home or workplace. Send a notification (with route information) to mobile devices. List of cities where you can set public transport routes. Click Route on the map or the place card. In the Routes toolbar that opens, enter your starting ( ) and ending ( ) points. You can manually set points on the map or enter an address. You can also add additional points to your route if necessary. Just click Add point in the toolbar and enter the point. You can enter a point by clicking on it on the map or by typing an address or geographical coordinates with your keyboard (more about the entry format). The coordinates will automatically turn into an address as you type them. 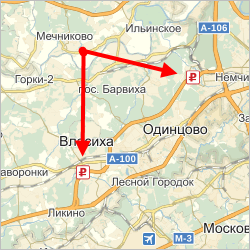 After you set your starting and ending points, Yandex.Maps offers between one and three route options: The first option is purple, while the second and third are gray. The first route gets you to your destination the fastest (in less time than the second and third route options). The second route takes more time, but is simpler to navigate than the first one (there are fewer route segments). The third route will take the longest, but it is the simplest option. If you select “Show options with traffic jams”, the system will factor in traffic jams when setting your route options. Parts of the road that include tolls are marked using the local currency: , , and so on. Add your Home and Work points to My places. Open the My places list. Select a place from the list. Click Set route in the place card that opens. This will set a route to your chosen map item. To select a route option, click on a route in the Routes toolbar or on the line for that route on the map. The route you choose will be colored purple on the map and surrounded by an orange frame in the Routes toolbar. When you create a route, you can select the route type: by car, on foot, by bicycle, using public transport (which may include pedestrian sections), or by taxi. Some route types are not available everywhere. When you click one of the buttons (i.e., select an option), your choice turns yellow. If you change route types, the routes that you previously set will adjust in accordance with your latest selection. The itinerary type will also change. The route creator works with all types of public transport that operate within city limits. The maximum length of a walking route that can be set is 50 km. Walking routes can be set in Russia, Ukraine, Belarus, and Kazakhstan. Yandex.Maps lets you set optimal public transportation routes in the cities listed in the Cities where you can set public transport routes section. To view an itinerary, click See more in the route card. A car itinerary is a list of segments on a route going in one direction that are separate from neighboring maneuvers. The length, street name, and direction (straight, right, left, or circular) is indicated for each route segment. You can collapse the route toolbar. To expand the toolbar, just click on it again. After you set your starting and ending points (from A to B), you can switch your route direction (from B to A). If you change the direction, you will be rerouted. You can extend a route by adding up to eight additional points to it. Click the Add a waypoint link in the Routes toolbar. A field appears where you can enter an additional point (“C”). Enter the position of your new point (for more information, see Create route). You'll see one route option in the results “А→B→C”. Click on a point along a route. Hold the left mouse button and drag the point to the appropriate location. Your route and itinerary will adjust accordingly. To delete an additional point, double-click on it. To move a route point, drag it to the appropriate place using the mouse. If you drag the starting or ending point of your route to a new position, both the map and the Routes toolbar will display its new location. You will be automatically re-routed. To reverse the order of points on a route, drag a point in the list to the appropriate position. You will be automatically re-routed. To change the address of a point on your route, click on the point address field and make your correction. If you are getting directions or looking for a particular place on Yandex.Maps, you can send a notification, which contains information about the place or directions, to your mobile device. To do this, click Send to phone in the route card. Click Edit information in the itinerary. A feedback form appears that corresponds to your route type. Select an appropriate option: Incorrect turn or I know a better route. The corresponding entry form opens. 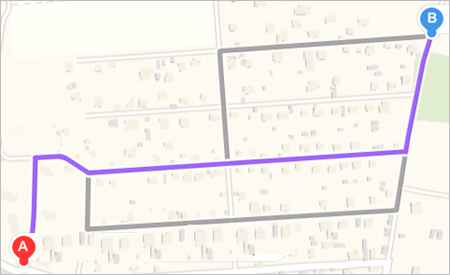 Incorrect turn — click on the route segment where you found the error and select a description from the menu that opens. I know a better route ─ draw your preferred route on the map. Fill out the fields in the form and click Send.